Documentation of the Maple Grove (Hoss) Cemetery, established 1883, near Valley Center, Kansas. Includes a brief history of the cemetery and the cemetery association, and an index of cemetery monuments' inscriptions. 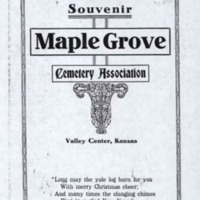 Little Arkansas Chapter of the Daughters of the American Revolution, “Maple Grove Cemetery, Valley Center, Kansas,” Digital Valley Center, accessed April 21, 2019, https://valleycenter.digitalsckls.info/item/57. Our search began by visiting Merle Thompson, who had grown up 1/2 mile from the cemetery, and cared for it many years. The original plat, on silk fabric and housed in a tin tube, has been copied. There were records available during the 1920-1930 period when permits were given by the City Clerk of Valley Center. On these permits were the names of the deceased, date, and what they died of. This information is included. The cemetery is not a segregated resting place, as there are several black families buried there. Information from the local newspapers has been included without reference to location. Our thanks to the Grant Township Trustees, Merle Thompson, and Vickie Reffner Kingsbury. The cemetery is 1 block east of the U.S. I-35 at Exit 17. Block 1 Lot 58	BRIGGS, A. M. B. •? Block 1 Lot 58	BRIGGS, L. B.
BURNS	(Stone off base) (Footstone) E. B. Block 2 Lot 45	HILL, NELLIE B. Daughter of/J. E. & J. Hill/ Born/Feb. 9, 1874/Died/Jan. 2, 1890/"Blessed are the dead/ who die in the Lord." Block 2 Lot 50	HOSS, JAMES MARSHAL	James/Marshal/son of/J. H. 6 M. E./Hoss/Died July 2. / Aged/ Y 6 M/5 D/"Not lost/but just gone before/ waiting on the other/shore." Block 2 Lot 51	HOSS, SUSAN	Susan Hoss/born/Jan. 13, 1813/ Died/Oct. 22, 1898/"She was loyal to God's family and country." Block 2 Lot 48	MCMULLEN, BARBARA JUNE	Daughter/Barbara June/MCMULLEN/ 1934/1957 "Now I lay me down to sleep." (Footstone) "Daughter"
Block 1 Lot 7	RAYMOND, HARRIET	Harriet A./Wife of/C. Raymond/ Died Feb. 1, 1893/Aged/82 Y 5 M/RAYMOND/"In loving memory of Charles & H.A. Raymond." Block 1 Lot 7	RAYMOND, HARRY L.	Harry L./Son of/H. H. & Sadie Raymond/Died/Mar. 18, 1899/ Aged 19 Y 8 M (Illegible script) Footstone "H. L. R."
Block 1 Lot 8	RICKMAN, BERTHA LOUISE	Bertha Louise/daughter of/ J. P. & Kizziah/Rickman/Born Dec. 8, 1889/Died April 10, 1904 "A precious one from us has gone/A voice we loved is stilled/A place is vacant in our home/which never can be filled." Block 2 Lot 63	STEVENSON, BESSIE L. Daughter of/J. M. & S Stevenson/Born/July 31, 1887/ Died/Feb. 12, 1889 "Budded on earth/Blooming in heaven." Block 1 Lot 20	SOMMERS, IDA MAY	Ida May/Wife of/Z. F. Summers/ Died/Feb. 9, 1882/Aged/24 Y 4 M "Sleep dear wife, friend & Mother/Sleep beneath the —"
(1) R. J./daughter of/Georqe ____ Sarah/Dad /Sept. 9. ?